Crown Allotments 79, 111, 112, 113, 114, and 115. 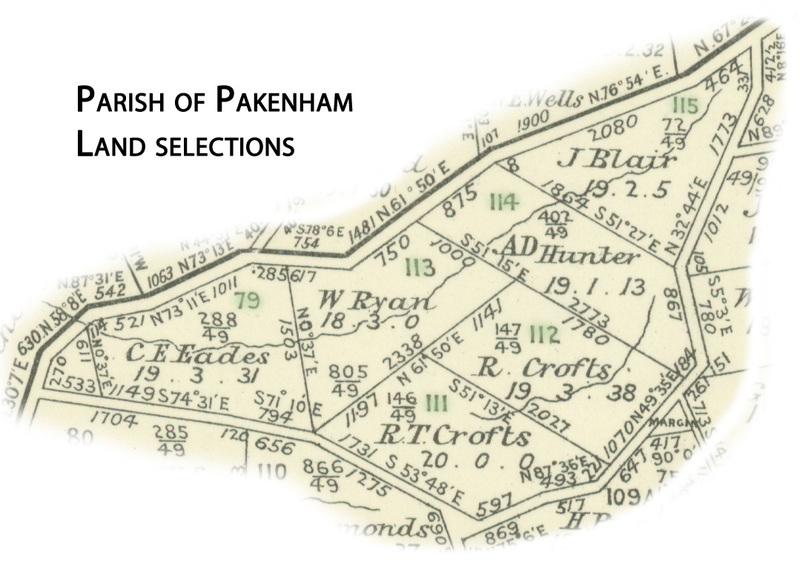 Parish of Pakenham. In 1877 Robert Tring Crofts, a provision merchant in Swanston Street Melbourne, owned four 20 acre allotments (CA79, 111, 112, 113); selections either taken out in the names of family members or taken over from another selector, Mrs Charlotte Eades. He spent £800 on improvements to the properties, including fencing, buildings etc. 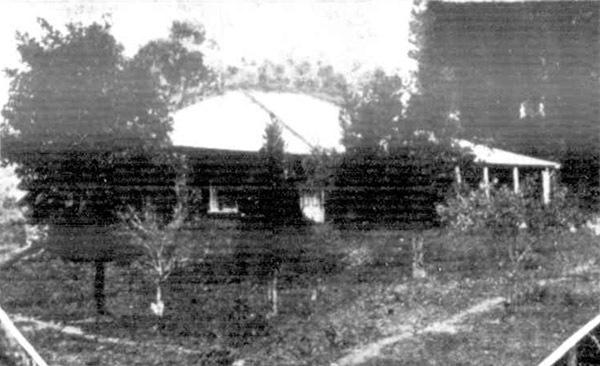 William Ryan, who was Crofts' brother-in-law, and was one of the original selectors, probably lived on the property and had built two log huts roofed with bark. A fowl house was also built. He named his property 'Walnut-Grove' and offered transport to visitors in his waggonette by the trip or by the hour. An inspection in March 1882 concluded that Ryan was behind in his rent, and he applied for a transfer of his licence (to Crofts) as the land was not fit for cultivation, except fruit trees, and that he lacked the means to carry on the same. 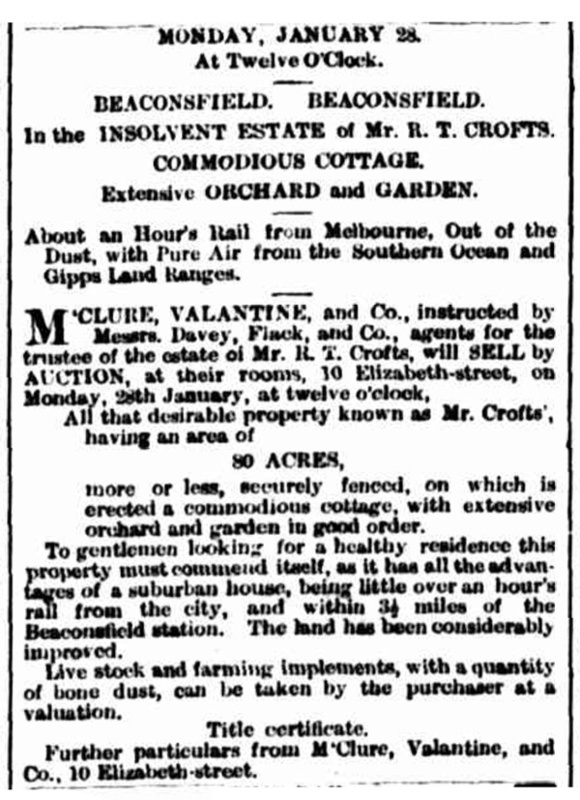 When questioned about Mrs Eades' selection, Crofts claimed that he was residing on the adjoining block weekly or fortnightly, but stayed in Melbourne for business reasons at other times. An inspection in 1882 showed that there was no fence between Eades and Crofts. Mrs Eades would have been well known to a number of Beaconsfield selectors, as her late husband, Dr Richard Eades, was a medical doctor. After her husband's death left her and her infant children nearly destitute, a subscription for her included donations by Dr Blair, Dr LL Smith, Jos Bosisto, and Dr Halford. On 25 March 1883 Crofts obtained a mortgage from the London Chartered Bank. The bank held the leases and title certificates as security, and eventually took out the Crown Grants to PAK-111 and 112. By 1 Oct 1883 Crofts' business had fallen off, and he filed for insolvency. There was a deficiency on his accounts of £480. On 28 January 1884 the 80 acre property was for sale by the trustees of his insolvent estate, and was described as a “desirable property … on which is erected a commodious cottage, with extensive orchard and garden in good order.” Livestock and farming implements were also for sale. 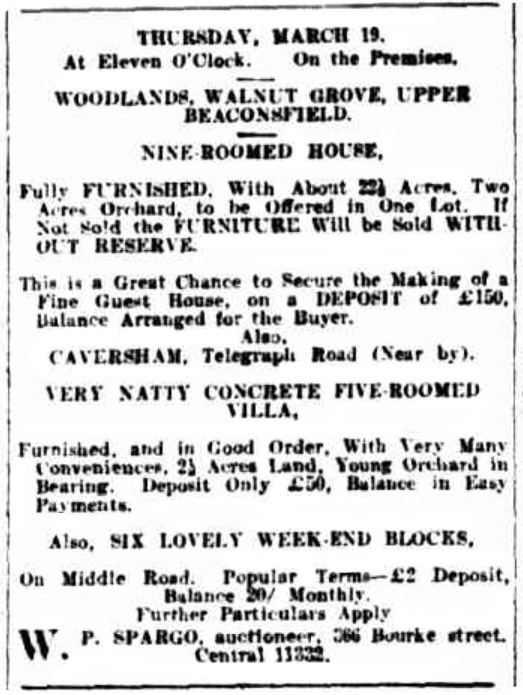 Executrix's sale of Walnut Grove, advertised in the Argus 6 May 1887. Charles Swift, a storeman, bought the property in this sale, but two years later the rates were paid by Archibald Dickson Hunter, the owner of the adjoining property (CA 114). His selection was next to that of Dr John Blair, MB MRCS of Collins Street Melbourne (CA 115), who was his brother-in-law. The ownership of the 120 acres changed from Archibald Hunter being the sole owner, to Hunter and Dr Blair being tenants-in-common, then to Mary Blair being the sole owner after her husband's death and her brother's bankruptcy. Dr John Blair was born in Bo'ness (Borrowstouness), Linlithgowshire, Scotland in 1834 where his father was the harbourmaster. Mary Hunter was born in Broxburn, a village nearby, in 1838. In 1854 Mary, her parents and five siblings migrated to Melbourne. Her mother died the following year, and her father with at least some of his children returned to Scotland. It is not clear if Mary Blair remained in Melbourne, but she was here in 1867 when she married Dr John Blair. Blair was the principal mover, proposing to build the Prince Alfred Memorial Hospital. He argued that extending Melbourne Hospital was a bad idea, as the hygiene through open sewerage down Swanston Street was already a threat to both patients and residents. A new hospital should be built away from the city. By the time the hospital was finished in 1870 James Service, later Premier of Victoria, and the surgeon, Dr John Blair, were known as the principal founders of the hospital. He was associated with the Alfred for the rest of his life and worked as an honorary surgeon at the establishment, as well as treating patients at his private rooms in Collins Street, and making home visits. After Dr Blair's death on 9 Mar 1887, Mary Blair inherited his share of the Beaconsfield property, and shortly after her brother Archibald filed for bankruptcy. She was now the sole owner of the property in Beaconsfield as well as of Blairgowrie, their house in Sorrento. Twice in 1887 her properties were put up for auction, and both times no buyer could be found. 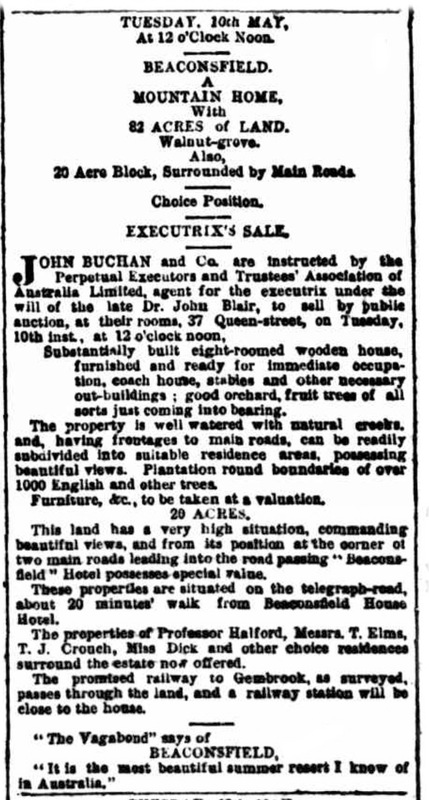 On 20 Dec 1889 Mary Blair sold the two eastern blocks to William McCrea Hick, a woolbuyer. It was shortly thereafter that the government decided to rent the property for the female inebriate's retreat. It is not known how much rent Mary Blair received, but it seems that it was not enough to pay for her and her adopted Aboriginal son Lani Mulgrave Blair's living expenses. On 31 Oct 1890 Mary Blair took out a £5,400 mortgage with interest of 7% per annum from Albert Duncombe Terry, a pioneer in the brewing industry. As security Mary Blair gave him the titles to the Beaconsfield and Blairgowrie properties. By 1893 Terry was mortgagee in possession. Albert Terry kept the properties until his death, but would have had tenants to cover his expenses. There are only records of one tenant, Mrs Jessie Mason, a widow with children. We only know about her because in April 1906 tragedy struck. Her youngest son Iggy Mason, aged about 19 years, wandered from the house and never returned. He was described as being of weak intellect, and also had physical disabilities. Large search parties, including black trackers, were involved in trying to find him, but he was never found. It is likely that he perished by falling into a mine shaft which were located all over this area. A couple of days later Agnes Mason, Iggy's younger sister, was killed when she sustained a fractured skull when she was thrown from her horse on an errand to Beaconsfield. After Terry's death, his estate sold the Beaconsfield property to Jessey Sykes for £190, but the family retained Blairgowrie for many years. Jessey Sykes was a former Berwick Shire councillor, land selector in Upper Beaconsfield and publican of the Pine Grove Hotel from 1894 to 1901. 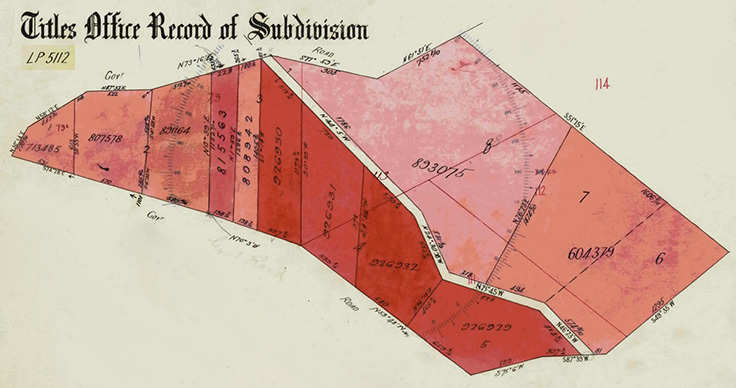 He immediately set out to subdivide the property, and sold off portions of the land. By the time Jesse Sykes died in 1915, he had sold about 60 acres of the subdivision. Walnut Grove (Lot 8 of subdivision 5112) was initially advertised as a furnished house for rent, and was then sold to the Hay family c1914 for £425. It was not until 1919 when they paid the final instalment and the title was transferred to two of their children. The Hays renamed the property 'Woodlands'. Little is known about Robert Hay and Emily Hay. Robert was born in Scotland, Emily was born in Vienna, Austria. They had six children who were grown up when their parents moved to Upper Beaconsfield. One of their daughters, Esma, married a local orchardist, Lindsay Kerr. On 19 March 1925 the property was for sale. William Lang bought it on 24 July 1926 on generous terms. It was not until 1941 that the title was transferred to him. After his death it was passed on to Harry Lang, and later to Harry's nephew Gary Butterfield. 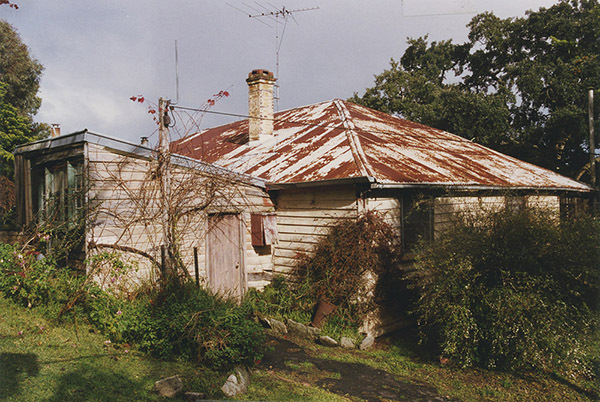 The heritage listed house stayed in the Lang family until May 2001, and the old house was demolished in August 2003.